Winterbrook Estate Agents - News- It’s Not Too Late To Stop Gravel Pits Here! 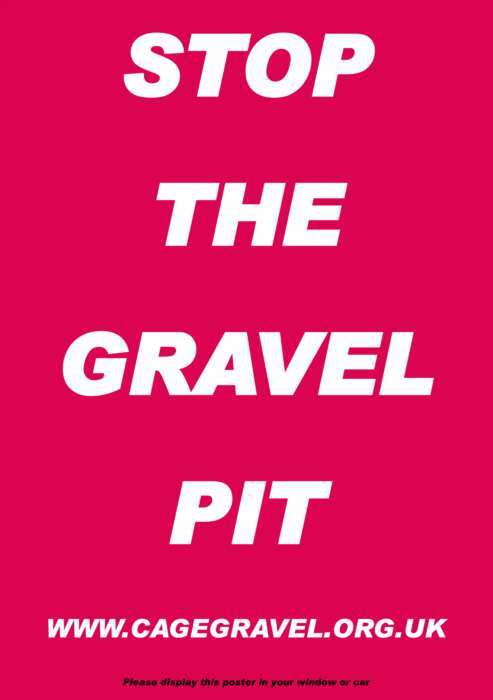 It’s Not Too Late To Stop Gravel Pits Here! Lesters support Cage Gravel we don’t want a huge ugly gravel pit here. We still have time to change this. A government Inspector will hold pre-hearings in September and we need your support and show your opposition to this happening on our doorstep. As a local business with the two partners and all the staff living locally we are opposed to this area to be used for Gravel extraction. There are less sensitive areas elsewhere, heavy Lorries creating dust and traffic problem will blight our local roads and our landscape would be affected for many years to come. Please contact your local MP Ed Vaizey at vaizeye@parliment.uk or contact Oxfordshire County Council , Mineral & waster Deposit Team, OCC, Speedwell House, FREEPOST, OXFORD OX1 1NE. www.cagegravel.org.uk or pop into our Wallingford Office at 23 St Martin’s Street to sign our petition against this potential atrocity on your doorstep.